Last month, while I was at the Shu counter picking up another oil cleanser, I realized I had never tried their Depsea Water Mist. 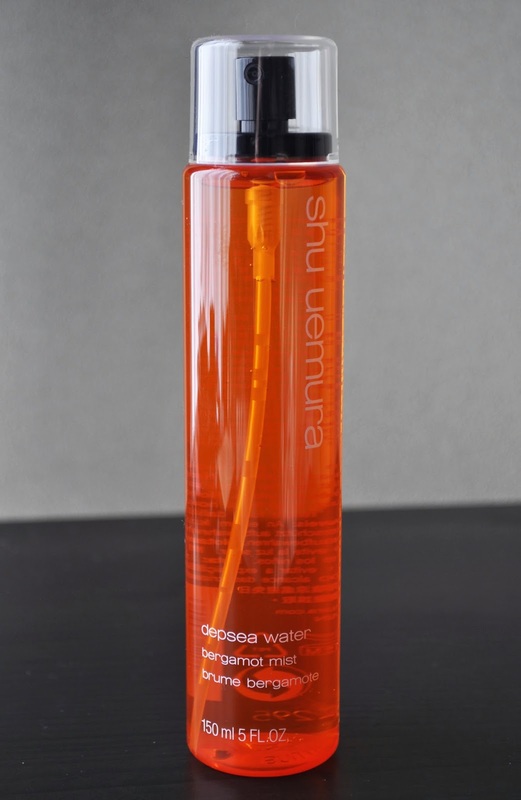 Retailing at ¥2,300, I decided to forgo repurchasing one of my facial mist staples (there are five or six sprays I like to route between, and yes, they will be featured on the blog), and try the Shu Uemura Depsea Water Mist. I love bergamot anything, so, of course, bergamot would be the one I'd pick up. I'm a fan of facial mist sprays. Are they vital to one's skincare regime? No. But, my dry skin surely appreciates what they have to offer. After cleansing my face, in place of a toner (or before), I mist my face, and follow-up with my usual morning/night time skincare regime (i.e. serum, moisturizer, etc.). I find this added step helps lock in moisture of whatever products proceed it. Also, If I don't have time to wait for a moisturizer to sink in before applying my makeup, I'll prep my skin with a facial mist, and then message in a few drops of a facial treatment oil. I love, love, LOVE the gorgeous, radiant glow this combination ejects into my skin and makeup. I don't use facial mists as setting sprays, but they are great in helping the makeup settle into the skin, instead of sitting on top of it and looking powdery. I don't know anyone who likes that look. Another benefit to these sprays are how they refresh my skin/makeup throughout the day. If my face feels taut or looks tired, a few spritzes help to soothe and rejuvenate. Most of these facial mists have a soft, pleasant fragrance; they give an extra boost that helps me relax and feel uplifted (acting as a form of aromatherapy). In addition to using this product for skincare, I also use it to apply eye shadows wet, with pigments, cake liners, etc., as well as to dampen brushes and sponges. After one month of using Shu Uemura's Depsea Water Mist in Bergamot, I really like it. I love the sturdy plastic packaging of this product; the spray cap's glossy finish and how it curves to hug my finger perfectly. Also, I have a little crush on the nozzle; the way it disperses and splays the product out evenly is brilliant. I've been without a misting spray for three weeks, and I'm not staying that it's solely because of this product, but once I incorporated it into my regime, the tiny dry patch I was getting on my right cheek is gone. My skin looks and feels calm, smooth, soft and hydrated. Will it replace the other facial mists I use? No. But, I will be adding it to my lineup; also there are a few other fragrances in the line I want to try. What's your take on Facial mists? I wanna try this out too and see how it will work on my skin. Kinda curious on this. I also love the packaging. I'm half way through and I already have my eye on the lavender scent. I think it will be lovely for Spring. I LOVE the Shu sprays, and I miss the smaller sizes that they used to sell bec they were killer for travel. Stupid 3oz rule. I also love the Bergamot scent as well as Lavender. We have to buy online now in the states, and that's honestly kept me from repurchasing.